Since last summer, you can always take real-time project data with you – on your smartphone. 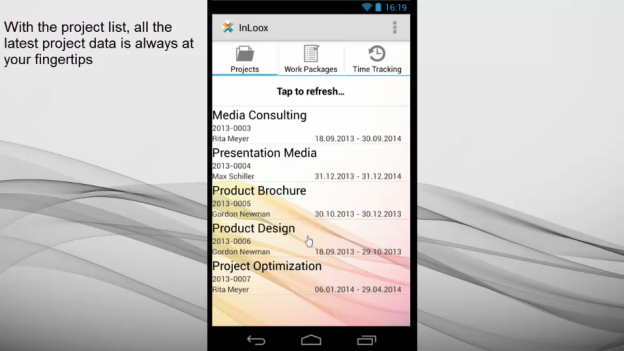 The InLoox Mobile Apps for Android and iPhone enable you to manage projects on the go. Our new tutorial video takes you on a little product tour and shows you the things you can do with InLoox Mobile App. The Android app is available for free on Google Play for anyone with InLoox PM Enterprise Server and InLoox PM Universal User licenses or with a Universal User access to InLoox now! Please click here to get an overview of InLoox Mobile App. To watch the entire tutorial video, please click here. The tutorial for InLoox Mobile App for iPhone will be available soon – we will keep you updated. Tutorial: InLoox Mobile App for Android - InLoox • Copyright 1999-2019 © InLoox, Inc. All rights reserved.